I was saddened yesterday to learn of the death of Jill Clayburgh. The 66 year old actress died on Friday in her Connecticut home. According to ABC news and the LA Times among other reports, she’d had chronic lymphocytic leukemia (CLL) for 21 years. This means she lived with CLL for nearly a third of her life. It happens that I used to spend much of my time thinking about CLL; it was the focus of my laboratory’s research program, and I cared for many patients with this particular form of leukemia. Chronic lymphocytic leukemia is the most common form of leukemia in adults in Europe and North America. The National Cancer Institute reports that there are approximately 15,000 new cases each year in the U.S. Although CLL is not curable, it is an indolent type of tumor, a slow-growing cancer a person might live with for years and even decades. For this reason, it is perhaps the best example of a malignancy for which a “watch and wait” approach is often, but not always, appropriate. By now, in 2010, it seems the public has a good sense that the big C, i.e. “cancer” is not one disease, but many. For leukemia it’s the same deal: there are at least several dozen forms, perhaps over a hundred identified by now. The nomenclature can be confusing to people who receive a new diagnosis and to doctors, as well, who many not be up-to-date on new molecular classification schemes. The image to the left, from Wikimedia Commons, reveals a high-power magnification (1000 X) of a Wright’s stained peripheral blood smear from a patient with CLL. The lymphocytes, with the darkly staining nuclei and scant cytoplasm, are CLL cells. A helpful framework, I find, for understanding leukemia is to think, first, in terms of what kind of cell has become malignant in each case – what an oncologist would call the cell of origin for the tumor. Leukemia is, by definition (from the Greek roots leuk, for white, and haima, of blood) an excess of white cells in the blood. But there are multiple kinds of white blood cells, and each type can form one or more type of leukemia. 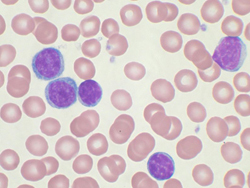 The most basic leukemia categories are three: tumors of myeloid cells, such as neutrophils and their precursors; tumors of lymphocytes, such as T or B cells; and tumors of other white blood cells that are less common in the circulation. CLL is a tumor of B-lymphocytes, the kind of white blood cells that normally mature to form antibodies. A second way of classifying leukemia is based on the rapidity of tumor cell growth. In CLL, the malignant B cells tend to divide slowly, rendering this a chronic, i.e. indolent disease in most cases. Now, the disease might be detected in its earliest phases upon routine blood testing, sometimes years before it would become clinically apparent by causing symptoms like uncomfortably swollen glands or fatigue from anemia. A Patient’s Internal Conflict of Interest: to Mention a Symptom, or Not? Please advise if you could share where i can find out the update information about below on your article, if that really any the update one, or this is the one ? is the most common form of leukemia in adults in Europe and North America ”.